The first meeting of the Garden Club was at Linderhof. Tea and treats are in order after the meeting. The hostess provides a treat or two. My treats -- flower painted teapot cookies and a rose geranium cake. The centerpiece is the Valentine's tulips. It is the Garden Club, after all, and there must be flowers for a centerpiece! The hostess also provides cups, plates, napkins and cutlery. At Linderhof, paper products are rarely used and so my glass plates, pastry forks (in a silver biscuit basket) and blue and white Spode cups (no saucers -- too hard to balance) and an assortment of tea napkins. The almond tea is served from my Grandmother's silver pot. It's sweet and almond flavored and goes so well with sweet treats. No sugar, cream or lemon needed! And although the cookies were declared too pretty to eat . . . there was but one left when everyone was gone! My co-hostess brought wonderful puffs filled with brandy laced creme patiserie which were topped with a strawberry and white chocolate teppenade and candied pecans. Please join Susan at Between Naps on the Porch for Tablescape Thursday. It's fun to see what everyone puts on their tables this Thursday! Those cookies look wonderful, Martha, but such a lot of work! Your tea table is impeccable. I'm sure the garden club if off to another great year. Beautiful as always! And I can't wait to see the Linderhof gardens this year! Martha, I just love your beautiful home. You could serve a McDonald's happy meal and it would feel very special! This table is so exqusitely set. It feels formal and warm and gives me a sense of elegance. The cookies are beautiful. I would love to be a part of a garden club! I get so excited to plant and dig and prune and harvest, that is until late July and August. Then when it is so humid that I am drenched when I'm out in the garden my enthusiam wanes. I'm looking forward to seeing some of the bounty of your gardens! Your dining room is the perfect place for a garden club meeting...your table is lovely, as always. 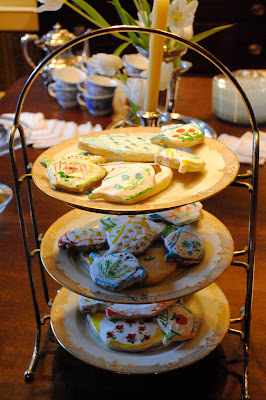 You did a fabulous painting job on the tea pot cookies...I am jealous as I don't have an artistic bone in my body! Oh my goodness, what a beautiful setting for the Garden Club meeting. Putting ours to shame - held in a drafty old church hall, with really awful intitution green crockery and a packet or two of biscuits. I really must speak to the committee! What a beautiful tea party! Love your cookies. Who wouldn't want to be part of that Garden Club? As always, your table is a treat and your treats look wonderful1. Yummy yum! Those cookies are too cute! As usual, everything is so pretty and put together so elegantly. I love your tea and cookies ensemble; thanks for sharing! What a wonderful place to serve your tea and those amazingly delicious looking cookies...I agree they look to good to eat...but I could probably manage to eat one or two! You always make entertaining look so easy! Your home is the perfect setting for this type of event, and your table is always so beautifully laid out. I tried the German Pancake (maybe I told you?) and it was a big hit! What a lucky garden club member to be invited to such a lovely tea. Your cookies are darling, and you made me laugh when you said there was only one left. Everything was so inviting and perfect. Can't wait to visit again. Wishing am one of the member of your garden club. So nice preapared. Oh, simply delightful. I love the silver biscuit basket for the cutlery. Martha, you know I just wait day by day to see what you will post - what magic you have worked as you graciously entertain. I love your table filled with the most lovely of traditional accoutrements. You are truly inspiring. Those of us "out here" who love what you do will think of you as we are encouraged to share our homes and tables with guests. Hi, Martha. Your home and your treats look absolutely beautiful! It's always inspiring to stop by Linderhof for a visit. Thank you for sharing your artistry with us week after week! Well, this is just beautiful. THank you for sharing. A garden club sounds delightful, too. The cookies are just beautiful and, of course, so is your table. As always, you are the consummate hostess. Lovely pictures.